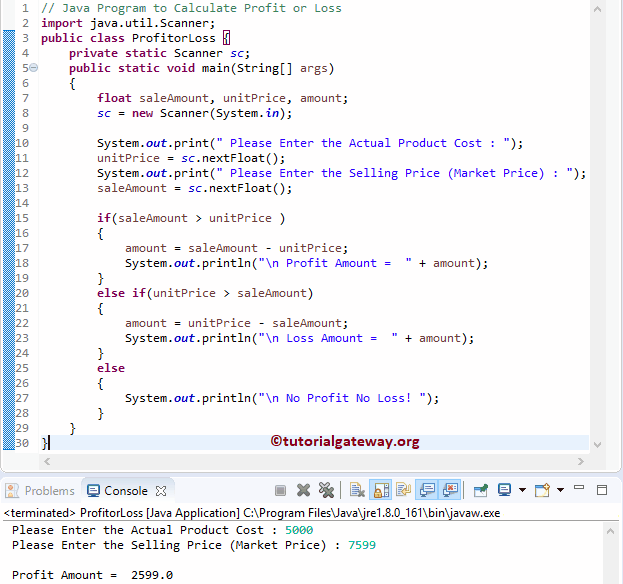 In this article, we will show you, How to write a Java Program to Calculate Profit or Loss with example. This program allows the user to enter the actual amount, and Sales amount. Using those two values, it will check whether the product is in profit or Loss using Else If Statement. TIP: Else If statement will check the first condition, if it is TRUE then it will execute the statements inside that block. If the condition is FALSE, it will check the Next one (Else If condition) and so on. This program is same as above but this time we are creating separate method to calculate the profit or loss.